#30: The unlikely dynamic duo of Bruce Wayne and Alfred faces a squad of high-tech thieves. Then Catwoman gets involved. 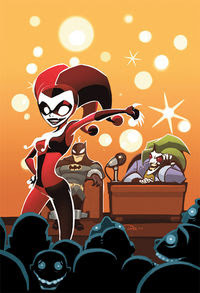 #35: The Joker and Harley Quinn take control of the airwaves! 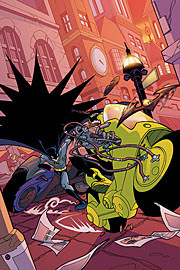 #36: Gearhead's turning Gotham City into a gigantic demolition derby! Batman's going to need all the help he can get, even if that means letting Batgirl get behind the wheel of the Batmobile! 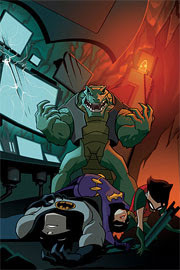 #37: Killer Croc's home are the sewers of Gotham City, and that "home" has led him straight to the Batcave! Batman's not going to be happy when he meets the cave's newest guest…. 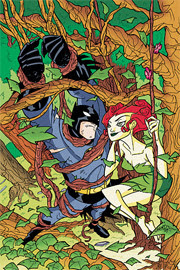 #38: Poison Ivy's out for a night out on the town, but don't worry — Batman and Robin are hot on her tail! What can the Dynamic Duo do when no one in Gotham City has seen Ivy committing a crime? 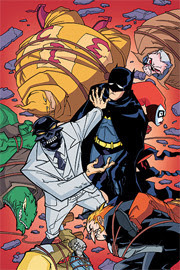 #39: The streets of Gotham City are free of criminals, and it's Black Mask's fault! Can Batman figure out how to stop a criminal who isn't committing crimes? I’ve been collecting THE BATMAT STRIKES for five months now and finally have enough issues that I feel I can read the series and give it a fair review. I sat down with a half dozen issues, one of which was signed by Russell Lissau, and gave it a whirl. THE BATMAN STRIKES is exactly what I thought and hoped it would be. This title promises to be a traditional superhero comic intended for children and it delivers on that promise. The stories are exactly what very young children need: self-contained and to the point. There are not any story line diversions or complicated histories to sift through. The writing is tight and the story moves along very quickly and is driven mostly by the action. One aspect that Johnny DC kept, more of a product of the days of yore, was the “letters” section at the end of the book. Ranging in ages from 4 to tween, kids are welcome to send in letters about and drawings of the elusive bat. These letters may seem trite and self-indulgent from the perspective of an adult, but to children these letters are a link to others who are like them. My friend, Larry, often speaks of wearing his cape, consisting of an old towel, to school on his first day of kindergarten. To Larry, and to many children across the nation, the comic book allows for self-expression and self-visualization, that other forms of entertainment do not. The students in your classrooms will love reading these letters and may be inspired to write their own letters and submit their own illustrations. (If you think just a bit, such a letter could fit nicely into a state standard.) If a student is inspired enough to write a letter or send an illustration to a publisher, then that is a child who is hooked on reading, a child who has a vested interest in what he or she is reading. That is a child who loves reading. Mission accomplished! The art is blocky – square – with heavy inks and lots of contrast. Details are sparse, but this is consistent with the art on the animated series. I was not sold on the art at first, but as I continued to read the illustrations grew on me. The illustrators do a good job moving the story along and creating action. The placement and design of panels seems to push the reader through the story, which works well in a self-contained story aimed at younger readers. In the end, kids will feel that this title is designed just for them. Johnny DC is the line of comics that DC publishes specifically for kids. I think all of the titles are tie-ins with animated shows on Cartoon Network or the WB. The story lines begin and end in the same issue and this is an important aspect for teachers. First, this means that every issue is a story unto itself. So the teacher is not required to collect every issue in order to maintain continuity. If a teacher misses an issue or more, then the story is not interrupted. Secondly, this means that a student who finished his or her work early can pull out any issue of THE BATMAN STRIKES and conceivably have it read by the time the class moves on the next assignment. Thirdly, these short, action-dominated stories are a part of differentiated learning. Self-contained, action stories are easy for struggling students, and students with disabilities, to read alone or with a friend. To that student who has given up on reading, THE BATMAN STRIKES and other similar titles may well be the thing that can give the confidence boost needed to help a student to discover reading for enjoyment. As I mentioned in the Story Review, I think a teacher could use the Letters section in the back of the book to get kids to want to write. This can include higher order thinking skills as student predict what has happened, connect it to something that has already happened, or make suggestions on what should happen in the future. Students frequently asks Johnny DC questions about upcoming issues and what will happen. What a venue. And to top it all off, maybe some of your students’ letters will be published. How cool is that? If you are tempted to think that comics are not real literature, then think again. Comics can help you keep students engaged, on task, and even help you meet your state and district educational standards. In other news, when I attended Chicago Comicon in 2007, I met up with writers Russell Lissau and Josh Elder. Click here for that article. We discussed, among other things, the need to have good all ages comics and graphic novels. Many comics have abandoned their roots in order to appease a more grown-up audience; however, the original comic consumer – the kid – is still out there and in desperate need for good comic literature. I’m glad to see that there are dedicated comic writers and illustrators, like Lissau and Elder, who work for the younger reader. 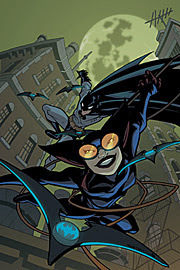 Do not pass up the chance to offer students titles such as THE BATMAN STRIKES, just because we adults have been told that comics are not real literature. THE BATMAN STRIKES is an important aspect in the hierarchy of comic literature that is a part of differentiated instruction. It is literature and needs to be offered in the classroom. You may find that your inclusion of such a title makes all the difference in that hard-to-reach child’s life. THE BATMAN STRIKES rocks.